Most people think of Lost and Found as a small, dark room, full of random lost objects – all destined to smell like a pile of old sneakers. Thankfully, this outdated model is (more or less) a thing of the past. Now, the greatest trial is getting your lost item back and for this process to be simple and compelling for the finder. Losing something valuable is bummer enough, but exhaustive hunting and filling out lengthy return forms can really get one’s goat (insert goat noise here). Also, what if you are the finder? Wouldn’t you want to know that the extra step you took will actually pay off by getting that lost item found by the original owner? Online Lost and Found has totally reinvented the whole process by taking a once tedious issue and revolutionizing it to ensure ease, privacy and security for both parties. An innovative Lost and Found service called ImHONEST.com decided to create a new spin on the old Lost and Found darkroom. You could think of their service as the eHarmony® of lost and found – (except it is free). Their intelligent matchmaking service securely “matches” people with their things – all across the globe. (Anyone travel much?) Their system does most of the work and only selects and sends potential lost and found matches. 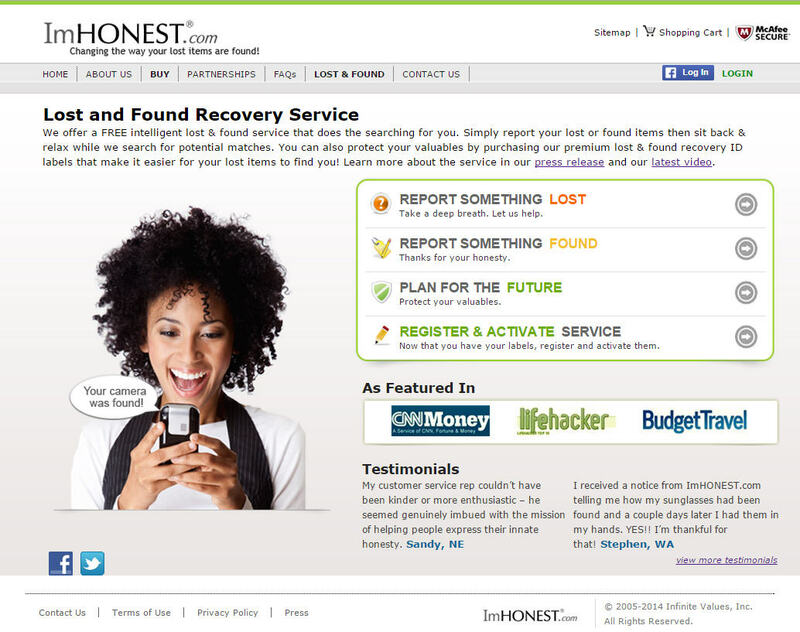 Hard to believe, but Lost and Found with ImHONEST.com creatively mixes social networking with a fun, results-oriented twist. Did you lose or find something? Why don’t you give the ImHONEST lost and found matchmaking service a try! You have nothing to lose (pun intended). If you give it a try, let us know about your experience or success stories. We’d love to feature your story on our website!